UK advertising expenditure grew 3.7% year-on-year in the first half of 2017 to £10.8bn, the highest total for the first six months on record. In the second quarter, meanwhile, the growth rate was 4%, according to the latest Advertising Association/Warc Expenditure Report. This marked the fastest quarterly growth since the fourth quarter of 2015. Mobile spending was up 38.1% across the six months, while overall internet spending was up 13.8%. Almost all digital channels recorded a notable increase in spend, with VOD up 8.8%, digital out-of-home up 29.1%, national newsbrands’ digital revenues up 15.6%, and digital radio up 22.2%. Only magazines’ digital revenues went in the other direction, with spend down 9%. TV spend, meanwhile, was down 4.4% across the first half of the year and down 2.5% in the second quarter. Cinema had a strong six months, with spend up 21%, while radio was up 5.2% in the half and 11.1% in the second quarter. But the grim circumstances faced by print titles continued, with a decline in total revenues, including digital, for national newsbrands (down 8.5%), regional newsbrands (15.3%) and magazines (15.2%). Stephen Woodford, chief executive at the Advertising Association, said: "Spend on advertising is showing strong resilience, at a time of real uncertainty for UK business. "We know advertising has a positive effect on the economy, with every pound spent generating six pounds of GDP, so it is good to see steady, sustained growth." 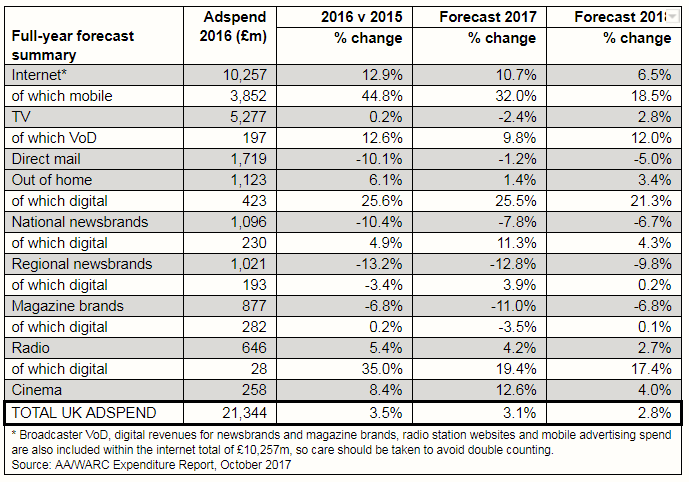 In 2018, total adspend is now forecast to grow 2.8%, to £22.62bn. TV, which was virtually flat last year, is forecast to decline 2.4% across 2017 to £5.15bn, before rebounding 2.8% next year, to £5.29bn. 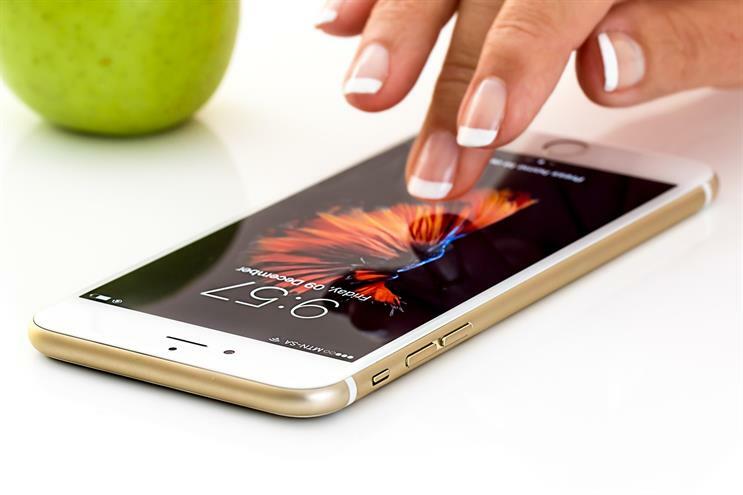 Mobile, which grew 44.8% last year, is forecast to increase 32% this year to £5.08 – taking it just shy of the total spend on TV – before surging past the broadcast medium in 2018, growing a further 18.5% to £6.02bn. Woodford added: "The upgrade of our 2017 forecast by a further one percent, the equivalent of an additional investment of £190m, should be seen as a cautious indicator for continued growth in the UK economy."